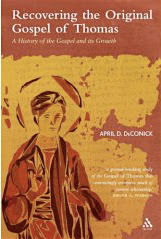 I have been given a preview of the cover art for the autumn 2007 paperback release of The Original Gospel of Thomas in Translation, the companion volume to Recovering the Original Gospel of Thomas. Since the cover art for the 2006 paperback version of Recovering was dependent upon my own "iconic" rendering of the apostle Thomas, I was asked to make a comparable design for In Translation. This way the companion volumes would look like companion volumes. So I decided to do an orality-scribality theme. 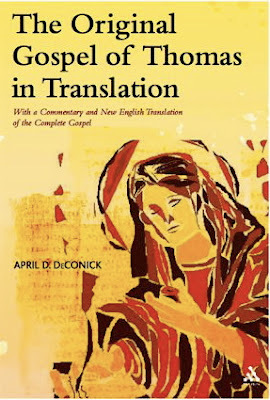 Since the cover for Recovering is the apostle Thomas teaching, I felt that the cover for In Translation should be the apostle Thomas scribing. Here he is sitting as his desk, hard at work "remembering" the teachings of Jesus and writing them down. I want to thank the people at Continuum who are responsible for making my renderings look so good on these covers, and for taking the risk of using an author's drawing rather than an image created by graphic designer.